The first oil pipeline in the United States was built in 1865, following the discovery of oil in Pennsylvania. By the early 1900s, major discoveries had been made in Texas, Oklahoma and Kansas and pipelines had become a common method of moving crude oil. However, these early pipelines have long since been decommissioned. They were small diameter pipes that were quite inefficient by today's standards. Leading up to World War II, pipeline companies were operating a maze of these small-diameter pipes laid out in parallel in order to carry enough capacity to fulfill the nation's needs for petroleum. Pump stations were powered by diesel engines, and were usually spaced every 30 miles. Each of these pump stations had to be manned around the clock to keep the system operating properly and the coordination of these multiple operating stations meant there was a lot more opportunity for human error. Following the war, a technological revolution took place. The need for technological improvements in oil pipelines was driven by three factors. •Consumer demand for petroleum in the prosperity of the Fifties. •The growth of American industry that took place during the war. Pipelines move nearly two-thirds of the oil and petrleum products transported annually. Pipelines are, by far, America's most important petroleum supply line, including crude oil, refined fuel and raw materials. 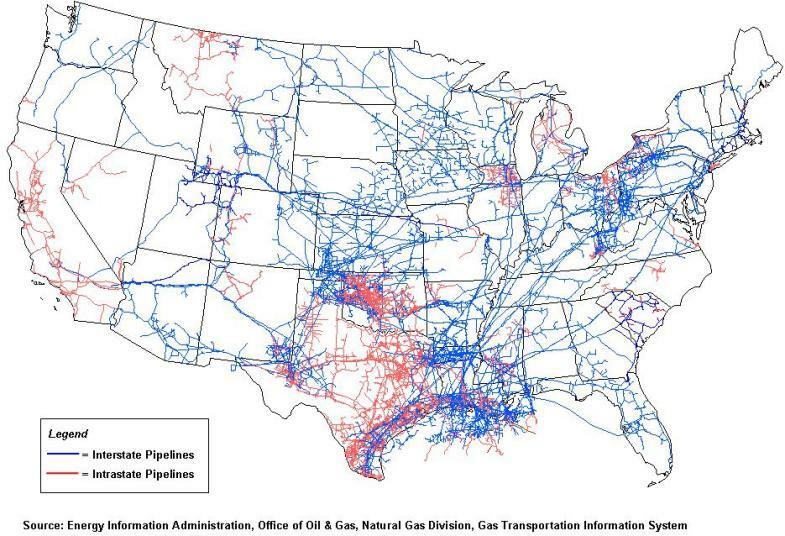 The network of crude oil pipelines in the U.S. is extensive. There are approximately 55,000 miles of crude oil trunk lines (usually 8 - 24 inches in diameter) in the U.S. that connect regional markets. The U.S. also has an estimated 30,000 to 40,000 miles of small gathering lines (usually 2 to 6 inches in diameter) located primarily in Texas, Oklahoma, Louisiana, and Wyoming with small systems in a number of other oil producing states. These small lines gather the oil from many wells, both onshore and offshore, and connect to larger trunk lines measuring from 8 to 24 inches in diameter. First, gathering lines are very small pipelines usually from 2 to 8 inches in diameter in the areas of the country in which crude oil is found deep within the earth. It is estimated that there are between 30,000 to 40,000 miles of these small gathering lines located primarily in Texas, Oklahoma, Louisiana, and Wyoming with small systems in a number of other oil producing states. These small lines gather the oil from many wells, both onshore and offshore, and connect to larger trunk lines measuring from 8 to 24 inches in diameter. Trunk lines include a few very large lines, such as the Trans Alaska Pipeline System, which is 48 inches in diameter. The larger cross-country crude oil transmission pipelines bring crude oil from producing areas to refineries. There are approximately 55,000 miles of crude oil trunk lines in the U.S. The next group of oil pipelines are those carrying refined petroleum products – gasoline, jet fuel, home heating oil and diesel fuel. These refined product pipelines vary in size from relatively small 8 to 12 inch diameter lines up to 42 inches in diameter. Refined products pipelines are found in almost every state in the U.S, with the exception of some New England states. The total mileage nationwide of refined products pipelines is approximately 95,000 miles. These pipelines deliver petroleum products to large fuel terminals with storage tanks to be loaded into tanker trucks. Trucks cover the last few miles to make local deliveries to gas stations and homes. Major industries, airports and electrical power generation plants are supplied directly by pipeline. 305,000 miles of interstate and intrastate transmission pipelines . More than 1,400 compressor stations that maintain pressure on the natural gas pipeline network and assure continuous forward movement of supplies . 24 hubs or market centers that provide additional interconnections . 400 underground natural gas storage facilities . A natural gas pipeline system begins at a natural gas producing well or field. In the producing area many of the pipeline systems are primarily involved in "gathering" operations. That is, a pipeline is connected to a producing well, converging with pipes from other wells where the natural gas stream may be subjected to an extraction process to remove water and other impurities if needed. Natural gas exiting the production field is usually referred to as "wet" natural gas if it still contain significant amounts of hydrocarbon liquids and contaminants.